Did you know that the City of Dyer now offers e-bills for utility accounts? 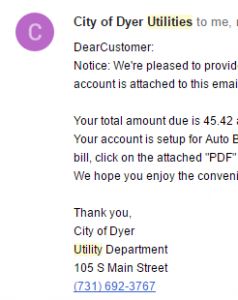 You can sign up to receive your utility bill by e-mail each month — you can even choose to have it delivered to multiple addresses! It’s convenient to sign up for e-billing online, simply fill out the form by clicking here. You can also call during normal business hours (8AM-5PM Monday-Friday), or drop by the office. All we need is your address and your email address! While you’re updating information, please verify your phone number with us. We send monthly reminder calls if your bill is a bit late and we also may call about your service interruptions or if we detect a leak at your address!